Quinoa (pronounced keen- wah) is touted as one of the latest ‘superfoods’ and apparently all the cool and beautiful people have recently discovered it. As you well know, I’m not in the ‘cool and beautiful’ department but I have been eating quinoa for years, and it rocks! 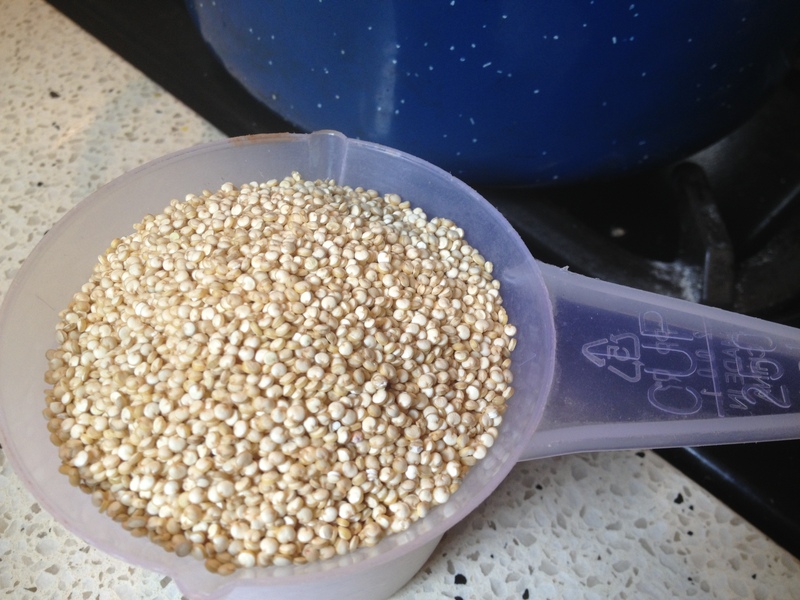 It looks like a grain but quinoa’s actually a seed; gluten free, low in fat, high in complete protein, and chock full of iron, magnesium, calcium, potassium and zinc. My previous efforts for the Potluck have included Vegan Broccoli, Cashew and Lime Soup and Creamy Satay Hotpot. I cup of quinoa, 2 cups of water or vegetable stock, 1/2 large or 1 small red salad onion finely diced, 1/2 to 1 cup of broken walnut halves, 2 oranges peeled with seeds and membranes removed and chopped into small pieces, 2 scallions/green onions/shallots chopped, 1 small bunch of coriander/cilantro chopped, butter lettuce or similar to serve. Place quinoa and water or stock into a large saucepan and bring to the boil. Reduce heat, cover and simmer, stirring occasionally, until all the liquid has been absorbed and quinoa is fluffy and delicious. Feel free to eat a spoonful or two as a taste test. While the quinoa is cooking, cut up your herbs, onion and oranges, roughly chop or break your walnut halves and drink some water. Water is good for you. If it’s cold drink warm water. There, doesn’t that feel better? 1 teaspoon of maple syrup, 1 tablespoon wheat-free tamari or soy sauce, 1/3 cup of fresh orange juice, 1 tablespoon of sesame oil, 1/2 to 1 teaspoon grated fresh ginger root (use this to taste! ), 1 to 2 cloves of freshly crushed garlic, 1/2 teaspoon Chinese Five Spice powder (optional but good). Whisk all ingredients together until well blended, or place into a lidded jar and shake vigorously to combine. If you want to eat this as a warm side, immediately toss all the other ingredients and the dressing through the quinoa and spoon onto your washed and drained lettuce leaves. For a cold side, let the quinoa cool and then add all other ingredients. It looks very decorative served up in a pretty bowl lined with lettuce, or it can be plated up individually. This dish makes for great left-overs too! To enjoy the rest of the Virtual Vegan Potluck recipes, click on the navigation buttons below. Clicking go back takes you to Canned Time – a vegan delight, where Angela has created the most delectable Pear and Broccoli Sprout Salad with Balsamic Caramelized Sweet Potato Cubes. Clicking go forward will land you at an unrefined vegan – hosted by the honestly amazing, undauntable, and most lovely Annie. Her blog is a thoughtful and beautifully assembled exploration of her journey into veganism, and that bumpy road we call life. Hugs and love to you, gorgeous Annie! Her offering today is Sweet Potato Fries with parsley, garlic and lemon zest. Annie is the original inspiration behind these Virtual Vegan Potlucks, and I’m so glad that I stumbled upon her blog about the time when I first started my own. Thanks too to Somer and Jason for all their efforts with making this Potluck happen. And if you’d like to start from the beginning of this fabulous Potluck click here. 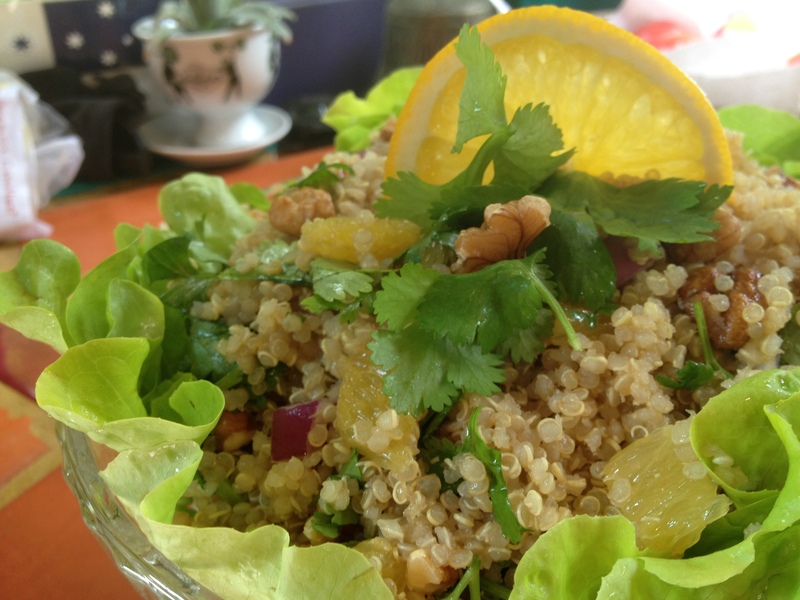 This entry was posted in Fast and Fabulous!, Food, Gluten-free, Salads, Vegetables and Sides, Vegetarian/Vegan and tagged asian salad, easy dinner recipe, gluten-free dinner, gluten-free recipe, Gwyneth Paltrow, high protein recipe, high protein vegan dish, quinoa, quinoa recipe, superfoods, superheroes, vegan potluck, vegan recipe by Cauldrons and Cupcakes. Bookmark the permalink. Happy Virtual Vegan Potluck 3.0 Day! I love quinoa, but I have never made any quinoa dishes with Asian flavors before. Have you tried the red quinoa? I have and it’s super yum too! Nicole I think you are both super cool and truly beautiful. Fantastic! and your quote above put a smile on my face this morning! I love grain based salads! Quinoa, cilantro, walnuts – sounds so good. Awww, Nicole. Thank you. You are lovely. And thank you for the scrumptious recipe. Hugs and hugs and hugs! PS…can you update your back link to connect w/ Angela at Canned Time: http://canned-time.com/pear-broccoli-sprout-salad-with-balsamic-glazed-sweet-potato-cubes/ Gaia’s Creations didn’t not show today. Done. Don’t we have some sensational recipes this year? A fantastic showing! People really went all-out. They sure did – I’ll be making new recipes all year now! Yum – I think quinoa is good any way!!! I love quinoa, this looks delicious! Yummy quinoa! This looks geat! 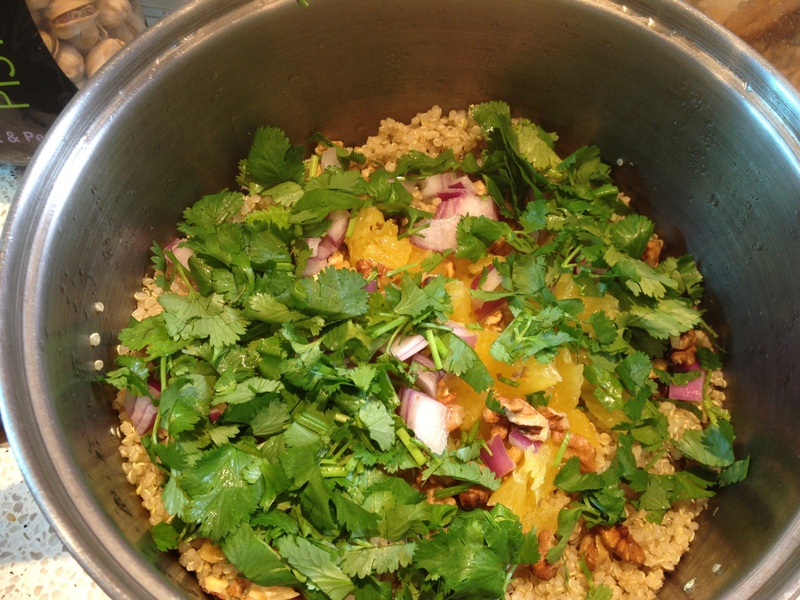 I love quinoa with asian flavors – yours look divine Nicole! Delicious! I’m mad on cilantro, or coriander as we call it in Australia. Makes it extra special! YUM this dressing sounds delicious and I am always down for some quinoa 😉 Happy potluck! I eat quinoa almost everyday, I just can’t get enough! This looks so good. I hope you try this recipe, Brittany. It IS really good! 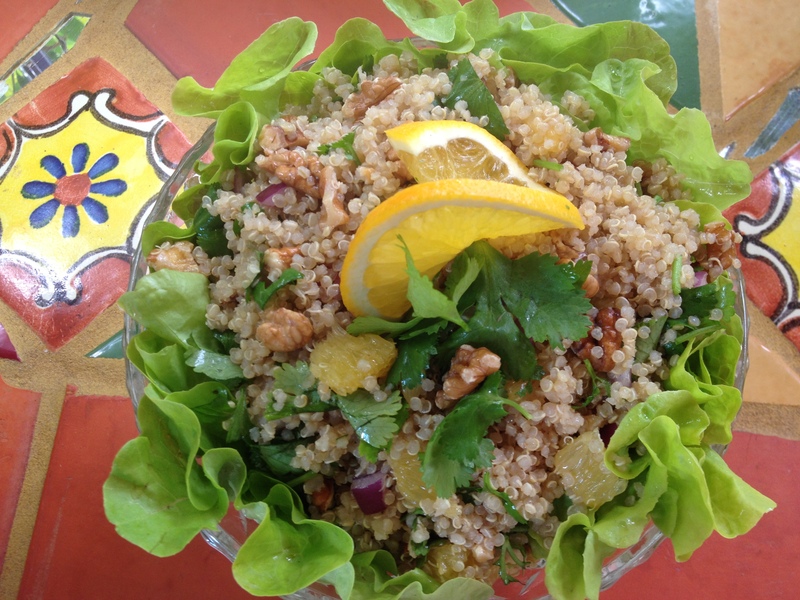 A divine & tasty mixed quinoa salad, my dear friend! Well done you! A grand & very tasty entry for this VVP! I agree here! MMMMM! This is really great. As I was reading the recipe, I was thinking that this will be great leftovers… and then you mention it too :). Thank you for the great side dish suggestion. Looks delicious, I love how quinoa absorbs all the flavours so well! Quinoa is so versatile! I love this, looks delicious.